CEOs have regularly declared that "improving sales and marketing alignment" is a top priority - and with good reason. Research has proved that well-aligned organisations out-perform their peer group across a wide range of key performance metrics. 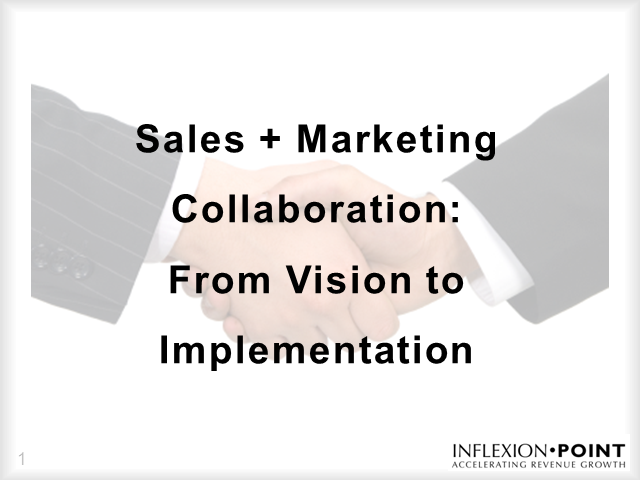 Bob Apollo of Inflexion-Point Strategy Partners will share a well-proven and highly effective process for quickly achieving high levels of sales and marketing alignment and collaboration, including a powerful collection of downloadable tools and templates. You will emerge with simple, actionable ideas that will allow you to systematically improve your sales and marketing alignment and collaboration. Bob Apollo is the founder and Chief Strategist behind Inflexion-Point Strategy Partners, one of the UK's leading B2B sales and marketing performance improvement specialists - helping ambitious B2B-focused organisations from start-ups to established players to build highly scalable businesses.